Arnott and Vederoff Ancestors - Plaque on Soldier's Monument in Perry Township, Monroe County, Ohio. Shows names of I. Bottenfield and W. Bottenfield, both of whom were Civil War Soldiers. Plaque on Soldier's Monument in Perry Township, Monroe County, Ohio. 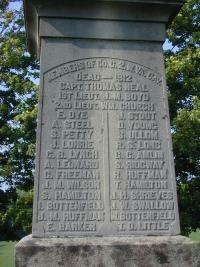 Shows names of I. Bottenfield and W. Bottenfield, both of whom were Civil War Soldiers.